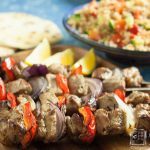 These easy lamb kebabs are made with tender cubes of lamb marinated in a simple lemon, garlic, and herb marinade then threaded onto skewers with peppers and onion. Combine the lemon juice, zest, oil, thyme, garlic and seasoning together in a shallow non metallic dish. Remove the meat and allow to come up to room temperature while preparing the pepper and onion. Peel and cut the onion into thick wedges. Thread the meat onto 4 skewers alternating with pieces of the pepper and onion. Cook on the barbecue or under a hot grill for about 10 minutes, turning frequently. Serve. If using wooden skewers remember to soak the skewers in cold water for at least 30 minutes before using to prevent them burning.